As with everything else, food and restaurants in Malta have been influenced by history, their neighbours and visitors. Restaurant fare in tourist areas is led by demand. Many of the visitors are British who are fond of their traditional fish and chips and the tastes of home, so you will find fish and chip shops (especially in tourist areas) as well as a good range of Italian, and even Chinese. Fresh fish and seafood are Maltese specialiites - enjoy bream, bass, swordfish, red snapper, octopus and squid. The names in Maltese may be different but there is a wonderful sea harvest to be enjoyed during your holiday and lots of fish restaurants. Some people visit the fishing village of Marsaxlokk just for the fish restaurants. 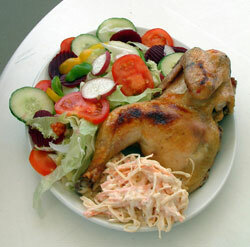 Small cafes will have meals familiar to Brits on the menu: chicken and salad, ham egg and chips, fish and salad and so on. If you aren't especially adventurous with food, your diet can be very similar to home. Rabbit is a popular meat on the Maltese menu. You will see it sold as fresh meat and included in recipes. Many British and international beers are sold, as well as international drinks. The Maltese have their own unique soft drink called Kinnie with a distinctive slightly bitter taste. There is a good selection of wines on sale, both locally grown and from around Europe and further afield. For those with a sweet tooth there are various chocolate puddings and pastries, ice creams and cakes such as doughnuts and vanilla slices. Maltese bread is incredibly nice - buy fresh crusty loaves and rolls on a daily basis. Foodies in search of fine dining will not be disappointed - there is a good number of high quality restaurants for that special meal. For people with coeliac disease and gluten allergies, gluten free products may be purchased in supermarkets but you may have to cook at home! Self catering holidays provide the best option.